I cast away at Mike’s Camp on Kiwayu Island in Kenya in 1992. My boyfriend and I had been traveling in Africa for five months and had spent the last month over Christmas and New Year camping on the beach north of Mombasa in an army green pole tent. Mike’s Camp on Kiwayu was a touch of luxury, only an eight hour felucca trip from Lamu, a spice island in the Indian Ocean. We lived in an open-sided hut woven from grass and slept under a mosquito net, sprawled under the light of the moon. Huge heads of coral surrounded the island covered in warm, clear water and at night the phosphorescence sparkled underfoot. The beach was wild and untamed, manned by pink crabs that played along the shoreline, the pink sand speckled with exotic shells. It was hot and sandy by day, the evening bucket shower short but cleansing. We feasted on fresh pineapple with coarsely ground pepper for breakfast, crab cakes for lunch and fish for supper. “Alhamdulillah!” Meaning ‘thanks be to Allah’. Eccentric, passionate and a little bit batty, rumor had it that Mike moved to the island to nurse a broken heart. He was the only permanent human resident. Mike liked birdwatching, star-gazing, shell seeking, oyster hunting or taking a boat trip to the mainland to sneak up on herds of unsuspecting buffalo. He liked skinny dipping by dark and only ever wore a sarong. One day some posh guests flew in for four nights from London. One of them was Susannah Constantine from the global style makeover show Trinny and Susannah. This was before she was famous and I can’t remember what Susannah wore because they only came down to the camp for meals, spending the rest of their time sequestered in their rooms. Probably scared by all the belching at meal times. I’m not sure if she’s ever been back but I’d love to visit Kiwayu again. Editor’s Note: These are photos of Mike’s Camp in Kiwayu if you’d like to find out more or visit. Mike’s still there and I’d love an update. He probably hasn’t even got internet and I notice his blog needs updating but Mike, if you’re reading this, I hope you remember me too and I hope you don’t mind me sharing my fond memories of your camp and your table manners. At least I haven’t mentioned the time you juggled with the spaghetti bolognaise. But seriously, you could do whatever you like at the table – Mike’s Camp and Kiwayu Island are still my idea of a perfect place and I dream of visiting again some time. 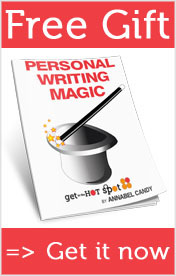 Join the personal writing practice and write about A Perfect Place. Just write your story about a perfect place or an idyllic time in your life. Post in on your own blog, link to the personal writing themes post and leave a comment so I know about it then I’ll link to your perfect place post here so everyone can read all the stories. Planning your next great adventure right now? Check out 5 Reasons I ALWAYS Get Travel Insurance Before Going Overseas or visit the Worldcare Travel Insurance site for a quote now. Do You Like Get In the Hot Spot? I hope so! I try to make my blog as inspiring, motivating and useful as possible. I’d love it if you can spread the word by sharing it on Facebook, Twitter, email or telling a friend about it. Please help me grow my blog by sharing it with someone else who’d enjoy it. You can use the buttons below to make it easier for you. Thank you. I really appreciate your support. If you’re new here take a moment to subscribe to Get In the Hot Spot by RSS or email. It’s a brilliant way to stay motivated and inspired plus it’s totally free. Subscribe now by email or by RSS Feed. Wow, I am almost dreaming of an get-away to a place like that! Seems like the island was little known but a treasure for Mike! Who needs fancy restaurants when offered fresh food! Hi Shruti, yes, fresh and simple is always best:) Loved reading about your perfect place too! This sound like a wonderful place! I love those out of the way places, that are not on everyone’s “resorts I want to go to” list. Last summer we went to a little place down in Florida that was part motel, part commune. It was right off the beach in a town called Flagler beach and it was awesome! There was a little tiki hut that was available to all the guests to use. It had a B-B-Q , sink, fridge to put your drinks in (you supplied your own). The atmosphere was rustic, but I would stay there again over any of the big hotels. I guess I just like things a bit more laid back! Wonderful! I lived in the Highlands in Kenya a long time ago, but visited the coast near Lamu and slept in a simple tent-hut on the beach. I’d love to try the island adventure! Hi Miss Footloose, I hope you get to. I never made it to the Highlands so hopefully next time. Kenya is an incredible country:) I wonder how long you lived there for? What an interesting post. I did go to the website and look at the pictures. I’m so glad I did because that made it all make sense and make your story come alive. I was having trouble picturing in my mind what kind of “hut” you stayed in and the one pictured is much bigger and cooler than I expected. In general the whole place was much “more” than I thought. What an unusual place. I guess it made me wonder what Mike is like………where did he come from originally? What does he look like? I have not not traveled as much as you have but if I had to pick my “Perfect Place” I would have to say the north shore of Kauai. I was there three times when my kids where 10 and under and it pains me now that they don’t remember it very well. It holds special memories for me on one of the most beautiful places on earth but they don’t remember. Here is just a simple memory but one I cherish. On Kauai you can not drive in a circle around the island. The northwest 1/4th of the island is so dense and rugged that they could not build roads through it. So we drove as far around to the north as the road would take us. There is a tropical beach there with a path that leads up to a special place up high where they used to teach hula dancing in the native days. It felt very spiritual and special to be there looking out over the ocean. I want to go back and take my kids and show them all the special places and discover new ones with them. The two oldest are grown now………where did the time go? It seems like I was just there with them in that beautiful place. Hi Cate, it really is! I had no problem choosing Kiwayu at all. The story transformed from an idyllic period of your life to a perfect place so I guess I was very happy while I was there and that’s why I love it so much still. I love that you’re living in your perfect place. I’m blessed to live in a gorgeous place too and I appreciate that every day. Annabel, this is a perfect venue for these stories. You’re going to make it with 2 blogs! Hi Dave, don’t know about making it but definitely managing it and enjoying it:) And it’s getting easier too! That is too cool … like a real life Gilligan’s Island! I did enjoy this piece, Mike’s Camp sounds fantastic and I bet it still is today. You’ll have to go back to check it out when you go on that long African family odyssey. I was brought up in a small Scottish town and longed to roam. Finally one day I made it to Zanzibar and went scuba diving there… I thought: ‘Wow!! This is IT… the acme of exotic living! !’ And it was! Meanwhile, back to the kids…. I believe its more where our head is at, either in the here and now – or as one glances back in time, which perceives and views the scene either through rose tinted glasses or with the windscreen wipers going. Hi Lisa, I agree:) Camping was bearable before kids but now I have to pack and feed five it’s too much! I always wanted to visit Africa some day and I hope Someday I will. Love the pictures! Not sure I understand the instructions, but here is the link to a perfect place post. The perfect place? Our own lives! I love Mike and Caroline! I hope they remember me. I think so;) I know Caroline will remember my husband Rich Candy. How are they all?! Love to hear from them. The website looks great and I figured you wouldn’t mine me using the pics since it’s all a great ad for the place. I hope to go back one day. Where are you? We are in Australia.